Over the last few years, NPQ has written about nonprofits employing workers “under conditions that keep the workers in poverty.” This is particularly prominent in certain fields, such as personal-care aides, which is on track to become the fastest-growing over the next 10 years, as the number of people in the U.S. over 65 is expected to double by 2050. 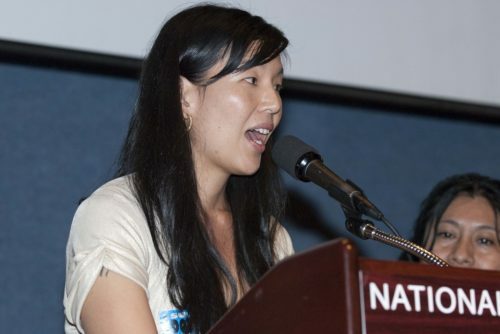 A recent opinion article in US News by Ai-jen Poo, executive director of the National Domestic Workers Alliance, highlights the need for “fair wages, decent working conditions and access to reproductive health care, including abortions” for care workers. Ninety percent of care workers are women. The majority of those are women of color, and between 30 and 40 percent are immigrants. Poo notes that the work they perform is highly skilled and valuable, but undervalued. In the US, “the average income for home care-workers is $17,000 a year. The median income for an elder care-worker…is $13,000 a year.” Further, domestic workers don’t qualify for basic worker protections like “limits on hours and overtime pay, days off, health benefits and paid leave.” There is also almost no room for advancement or path to higher earnings, save a few employers who provide peer mentor or senior aide positions. These conditions compound; for workers at such a low rate of pay, it’s nearly impossible to secure healthcare on the private market. The Affordable Care Act, particularly for the states that implemented Medicaid expansion (19 did not), helped these workers, who often otherwise don’t qualify. However, not only is the Trump administration trying to roll back these benefits, the federal Hyde Amendment severely limits access to abortion and birth control under Medicaid. Further, the administration’s attack on immigrants directly impacts this work force. Though private companies have entered the “ever-expanding long-term care sector,” and now dominate it, nonprofits have a key role to play in shaping this significant and growing work force. The National Domestic Workers Alliance is the leading organization in the US working for the inclusion of domestic workers in the Fair Labor Standards Act, which guarantees minimum wage, overtime, and sick and vacation pay. Improving workforce training and career mobility to ensure quality. Developing a path to citizenship for undocumented caregivers. Creating a national initiative to incentivize and recruit family caregivers into the paid workforce (Eighty-five percent of long-term care is provided by family members). Health coverage is also a significant goal for workers who have an on-the-job injury rate three times higher than the average US worker and work erratic hours, which affects eligibility for employer-sponsored plans. Once, Micronesia was the site of US atmospheric nuclear weapons tests. The health problems from the radiation persist, but the US has evaded responsibility.